The World Health Organization doesn't usually release long updates early on a Sunday morning (I received the email notification at 3:16 am EST), but the second outbreak of Ebola in the DRC in the past three months obviously has the WHO's full attention. Although only confirmed a few days ago, already the number of confirmed and probable cases has exceeded 40, with 33 deaths. I've only excerpted portions from a much longer update. Follow the link below to read it in its entirety. On 28 July 2018, the North Kivu Provincial Health Division notified the Ministry of Health of the Democratic Republic of the Congo of a cluster of suspected acute haemorrhagic fever cases. On 1 August 2018, the Institut National de Recherche Biomédicale (INRB) in Kinshasa reported that four of six samples collected from hospitalised patients tested positive by GeneXpert automated PCR. These presumptive positive tests prompted an immediate escalation of response activities by the Ministry of Health, WHO and partners, and the declaration of the outbreak by the Minister of Health. The prompt alert by the Ministry of Health to WHO, under the International Health Regulations, followed the detection and rapid investigation of a cluster of suspected viral haemorrhagic fever in a family in North Kivu Province during mid to late July 2018. Local health officials have since identified sporadic, antecedent deaths in the community since May 2018 (tentatively classified as probable cases), which are subject to ongoing investigation. The Ministry of Health, WHO, and partners are working to establish the full extent of this outbreak. As of 3 August 2018, a total of 43 Ebola virus disease cases (13 confirmed and 30 probable), including 33 deaths, have been reported. An additional 33 suspected cases are currently pending laboratory testing to confirm or exclude Ebola virus disease. Three healthcare workers have been affected, of whom two have died. Geographically, confirmed and probable cases are currently localised to five health zones in North Kivu Province (38 cases, including 13 confirmed and 25 probable), and one health zones in Ituri Province (5 probable cases) (Figure). 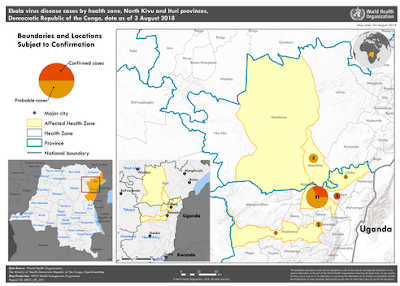 Suspected cases are currently under investigation in one additional health zone of Ituri Province. The affected areas host over one million displaced people and shares borders with Rwanda and Uganda, with frequent cross border movement due to trade activities. The prolonged humanitarian crisis and deterioration of the security situation is expected to hinder response to this outbreak. Further laboratory testing by INRB has detected Ebolavirus using conventional PCR in three of the initial batch of six samples from Mabalako Health Zone. These results are highly suggestive that Ebola Zaire species is the cause of this outbreak; however, genetic sequencing is necessary to definitively confirm the virus species. 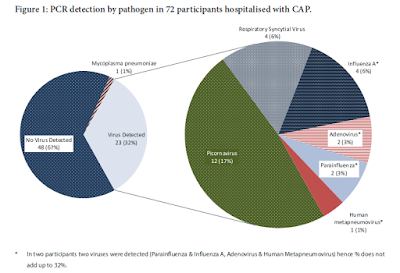 Characterization of viral sequences will help to inform the potential use of vaccines and therapeutics, and any link to the recent outbreak in Équateur Province – located in the far west of the country, some 2 500 km from the current outbreak. Currently there is no evidence to suggest that these events are related. This new outbreak of Ebola virus disease is affecting north eastern provinces of the Democratic Republic of the Congo, which border Uganda. Potential risk factors for transmission of EVD at national and regional levels include the transportation links between the affected areas, the rest of the country, and neighbouring countries; the internal displacement of populations; and displacement of Congolese refugees to neighbouring countries. The country is concurrently experiencing several epidemics and a long-term humanitarian crisis. Additionally, the security situation in North Kivu may hinder the implementation of response activities. Based on this context, the public health risk is considered high at the national and regional levels and low globally.